Esc the city launched its first event in the ‘She Series’ last week, which Adele reassured us was not a women’s event, at least not like the ones that we have become accustomed to. There was a real buzz of energy and excitement in the room as we heard from Emilie Holmes (Good & Proper tea), Harriot Pleydell-Bouverie (Mallow & Marsh), Victoria Eggs (Victoria Eggs), Lizzie Fane (ThirdYearAbroad.com) and the girls from Broad Minded. – The aim is not to turn us all into business women, CEOs, stay at home mothers, adventurers or a juggler of all of the above. It’s about finding out what you want and working together to get there. – There are no rules. Think outside the box. – These events are here to excite, engage, inspire, motive, unite women, but they are what you make them, so get stuck in and give as much as you take. Victoria Eggs designs premium quality home ware and gifts celebrating Britishness, all handmade in the UK. Founded by its namesake in 2011, Victoria Eggs evokes a true sense of British spirit through playful and punchy designs which bring a smile to the face. Fine Art graduate Victoria has been awarded many critically acclaimed accolades, including winning ‘Gift of the Year 2012’. In addition to featuring in publications such as The Sunday Times, Living Etc, Marie Claire and Time Out, Victoria Eggs is also stocked in Selfridges, Southbank Centre and West Elm UK. The Aprons have even made their TV debut on ITV’s This Morning! – What are you really selling? Think bigger than your product/service. – Who are you selling to? – Brand positioning– are you high end or low end? – Manufacturing– gets a great supplier and have back-ups just in case! – Be realistic– if your product is handmade and takes a day to make what happens if you get an order for 100? Harriot studied Fine Art and photography before leading emerging market research for a headhunting firm. She then founded De Bouverie, a fine jewellery website making independent designers more accessible. As a business, this became the learning ground for almost every mistake in the book, and is what she now refers to as her ‘MBA for Entrepreneurs’. She was then light heartedly challenged to make marshmallows and founded Mallow & Marsh, which has gone from strength to strength and is now carried in selected Sainsbury’s stores. Since the launch Mallow and Marsh has been ranked in this year’s Startups100 and Harriot has been shortlisted for Management Today’s 35 women under 35. – Be prepared to fail; it really is how you learn. Accept and embrace it. – Don’t over think it. It’s so tempting to spend weeks, months, and years meticulously planning your idea. Don’t. – Cut your budget in half. Check out the Lean Start Up by Eric Ries for proof, or come along to the Escape the City Start-up MBA. – Feedback is critical. Be a sponge and adapt. – Be the best, be remarkable. Lizzie studied in Italy as part of her degree course and, based on the problems and wonders she experienced, she founded ThirdYearAbroad.com in 2006 to support other students through the process and give them a place to pass on advice. The site is now the UK’s biggest network of students who study or work abroad and new high-growth products are designed for the target audience, such as YearAbroadInsurance.com and a Careers Platform. Lizzie is an Academic Associate of The Higher Education Academy and Communications Director for Speak to the Future: the UK’s Campaign for Languages. – Solve a problem. What bugs you? Don’t complain, fix it! – If you don’t know how to do something, learn. – There are so many resources out there to help new entrepreneurs not least your old university’s business/start-up/ entrepreneur societies. In 2012, Good & Proper Tea founder Emilie Holmes decided to take off her corporate advertising hat and don a trader’s apron, bringing her obsession for tea to the people of London and beyond. Leaving a successful career at Ogilvy & Mather, Emilie had a vision for tea done right. She parlayed her corporate advertising savvy into establishing a new “classic” brand that restores quality and craft to this quintessential component of British culture. She bought herself a stylish 1974 Citroen H van, had it fitted out for the tea trade, and opened her side window to London’s tea lovers. And the people of London are better for it. Emilie makes a mean cuppa. – You don’t have to do it right, you just have to do something! – ‘Cash is King’- you’ll hear it repeatedly in the world of start-ups but it’s true. – Get some perspective. Talk it out with someone you trust. – There is no such thing as ‘I don’t know’ Google is your friend. – Switch of from external negative forces. – There is no how to manual, each person’s journey is different, that’s the beauty of being an entrepreneur, so get out there and just does it! Inspire: Regular dinners with inspirational speakers and the chance for us all to share ideas and network. We feel there’s a real opportunity here for us to create a voice for women of our age and position. Educate: The opportunity to sign up for talks or courses on anything from managing your finances to leadership skills to presenting skills. Motivate: An out-reach program through which we go into schools and universities to offer talks and the opportunity for mentor matching with students. Click here to for their Facebook page. 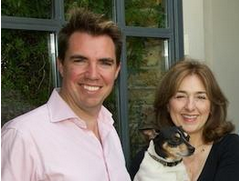 As always another fascinating Esc event last night (if you didn’t take a detour via the Eton boys entrepreneurs club) led by serial entrepreneur Penny Wing and her recent escapee partner in her new venture, brojure.com; Ollie Codrington. If you are looking for a simple 10 step program explaining ‘how to start up and sell and $15m business’, you may be slightly disappointed. Granted, Penny Wing has built and sold 3 successful group travel businesses from scratch and sold each of them in turn, the most recent having sold for $15m. However, that was through her own personal circumstances that led her to be in a position to take advantage of opportunities when they came knocking, which are difficult to distil down to a formula for others to follow and replicate. Instead, I personally learnt about more practical insights about the nature of successful entrepreneurs and the wealth of wisdom that both Penny and Ollie had to offer based on their own journeys. Do something different. Be creative, be brave, think outside the box. As a brief summary, Penny started out as an engineer with an educational background in math but through pure chance, was sat on a plane next to someone who owned a travel company and who happened to think that Penny’s frequent travel (she had lived in 36 different places before the age of 21) meant she was suited to a job in a travel company. By the end of the flight she’d been convinced to join his company and never look back. She spent 8 years in the industry working for someone else, honing her skills and understanding of the industry and then started her first company in 1988, in her living room, with $30,000 in savings. Three businesses later, each more successful than the last, she is on to her next venture brojure.com with Ollie, who coincidentally, she met on the Start-up MBA course run by Esc. What struck me as the root of so many of her successes in her many roles was the bold and courageous actions based on Penny’s belief in herself and the willingness to do things differently. From the get go she approached things innovatively, refusing to follow her competitors by creating lengthy proposal documents when pitching for business. Instead, trying something new, she created simple visual one pagers, which appealed far more, stood out from the crowd and secured her loyal multinational customers. One creative new idea led to another. From a need to be able to create these visual pitch documents wherever and whenever she wanted to, she hired a software developer to create a program for her. She then realised that these ‘brochures’ could be used by a multitude of different businesses; wedding planners, photographers, event planners, yacht brokers even, so decided to set up a software company, brojure.com to sell the program, despite no previous technical background. You don’t always need to have the exact relevant skills to create something successful. For one, don’t underestimate yourself. Whatever your background, you will most likely have transferable skills that are highly sought after in any new venture. Whether that’s the ability communicate professionally, be organised, manage a team, build great relationships you are more skilled than you think you are! On this note, an interesting point was raised about the benefits/disadvantages of MBA programs. Adele shared some of her thoughts having spoken to numerous escapees over the years. The choice to complete an MBA is personal and down to the individual, but question your motivation first. Do you want to do an MBA because you don’t know what you want to do yet and in effect is another form of procrastination? Do you have that nagging fear that you don’t have the skills to do what you want to do? Is it worth the time and money if you aren’t sure what specifically you are going to get out of it? Are there alternative ways to get the same information but from a less costly/time consuming resource? I like to think so personally. I feel that I learn in a far more constructive and efficient way by simply speaking to people, reading great books and experimenting in small ways with my ideas. One other thing, I think, is that to be truly entrepreneurial you need to do something different, be creative, be brave and there are so many people doing MBAs, perhaps it’s no longer a differentiator. If you really don’t have the required skills for your idea, no bother! Surround yourself with people that do. Penny’s strengths are in starting a business, growing them big, growing them fast and then selling them. She has no long term desire to run one company; she prefers to focus of winning big, high value sales contracts. Recognising this she started looking for a partner to run the business. Cue Esc the city and their brilliant start up MBA program. Interestingly both Penny and Ollie may not have been there. Penny was initially discouraged as she seemed on paper to be over-qualified, and Ollie was reluctant to come along as he didn’t have a business idea. Well, Penny convinced Adele and Adele convinced Ollie and as fate would have it they were on the same course and have been working together on brojure.com ever since. If ever there was a case study for there being no rules in life and for doing something different, this would be it. Ollie was a lawyer as of 4 years ago, but knew someday he wanted to run his own company. The problem was that didn’t have an idea. His quote above stuck with me as often we have an idea of what we want to and hold on to it so tightly. When we eventually get there it may not be what it first promised or what you were actually looking for in the first place. This, to me, highlights the value of micro testing your ideas. If you want to be a lawyer, go speak to a lawyer first or shadow one for a week. Figure out what you’d be doing every hour of everyday and the realities of the job before you commit to a degree or training focused on Law. Similarly with any other venture, if you think you want to be a chef, cook, write recipes, go volunteer in a kitchen, start a food blog. All low risk, low commitment, but will allow you to explore an idea before fully commit to it in an expensive, ‘can’t go back now’ way. What do Penny and Ollie attribute to their success? One of the things that came through strongly is to focus on your strengths and what excites you. Ultimately you can’t be good at everything nor can you be passionate about every type of task involved in your business. Penny is excited by aiming high, going after the big million $ contracts and is great at it. So why should she also invest time running part of the business and targeting the ‘low hanging fruit’, the small business owner, tasks she has no interest in. She recognises the value in it, but acknowledges it just isn’t what she wanted to focus on so brought on a partner, Ollie, who was excited, and good at doing just that instead. There is also no harm in aiming high. You have nothing to lose by having the intention to aim big. By leaving yourself open to all possibilities you are more likely to spot opportunities that you may have otherwise shut out. Case and point, brojure.com’s focus is service industries looking to pull together great visual material to show clients/customers. However, Ollie had a friend who had a friend who worked at British Gas, Centrica, and thought there was no harm in an introduction and a chat. As it happens, British Gas regularly pitch for work using presentations (who knew?! ), but there is a lack of consistency across the various different pitching teams. Brojure.com may well be just the solution to their problem. The power of speaking to people and a ‘what’s the worst that could happen? attitude’ can’t be underestimated and clearly paid dividends for Penny & Ollie. Another thing to note is that failure is inevitable. Both Penny and Ollie have failed as has pretty much every entrepreneur I have ever heard from. The lesson here is to fail fast, fail often and fail as many times as it takes to succeed. Also, consider your risk appetite and personal circumstances. Everyone’s different; one person’s shaking hands with a stranger may be another person’s skydive. Just honestly assess occasionally if you feel you are being too risky or too risk adverse. When asked what they would change looking back on their journey so far, both agreed that they needed to have far more software industry knowledge than they first anticipated. They wished they could have ‘seen the road ahead more clearly’. They recommended spending time with people who know what you want to know and learning from them and getting experience in you desired field or industry in any way you can. Penny remarked that today there is a lot of pressure to grow businesses fast and to make as much money as possible as quick as possible, but maybe there is some value in slowing down and doing a little more research. As an aside, Ollie brought up a really interesting point around status. As a lawyer he enjoyed being able to walk in to a room and others valuing his opinion and presence. There are a lot of added benefits to do with security, ego, and self-confidence that come from having what is defined as a traditionally successful profession. Even those closest to us find it difficult to accept when you do something less well defined/non-traditional sometimes; Ollie quoting his mum; ‘But what do you do? What are you going to be?’. ‘I’ll be your son?’ He suggested. Sometimes people just won’t get it and that can take a toll on your confidence, particularly if it’s someone you care about. Ultimately though, Ollie realised ‘we all want to be able to look back and have fantastic stories to tell our grandchildren’, to inspire and excite, no matter if we fail or succeed, we’d just like to be able to say we tried and had a great time in the process. What becomes clearer to me every time I go along to an Esc event or any else new for that matter is that difference between success and failure boils down to people who do and people who don’t. If you never stop learning, experimenting, challenging yourself, finding out what excited you and that you’re passionate about, you will always eventually find things that make you happy and fulfill you. Hey, look, no-one said it would be easy or without some tough decisions, but it’s dawning on me at least, that it really is as simple as getting out there and doing.